After the German “Ladenschlussgesetz” (‘business hours law’) it is normally not allowed to open regular shops on Sundays. So basically shops all across Germany are closed on Sundays. But of course for every rule there are exceptions – and this makes it very well possible to go shopping on Sundays. At least on some Sundays and/or in certain areas. On this page I’ll try to give you a broad overview of the different options you have if you want to go shopping on a Sunday. The German law used to be very strict about the opening hours. And even today owners of ‘regular shops’ like department stores and shoe shops still risk losing their license if they open their shop on a regular Sunday. But on some Sundays throughout the year it is actually allowed to have your shop open. And in some ‘high profile’ areas, where lots of travelers are expected that might be in need of this and that, shop keepers are even allowed to have their shops open every Sunday. On Shopping Sundays shops are usually open between 13:00 (1pm) and 20:00 (8pm) – some smaller shops may be only open until 18:00 (6pm). Most, if not all Berlin Flea Markets are open on Sundays. For further information check this page about Berlin Flea Markets. 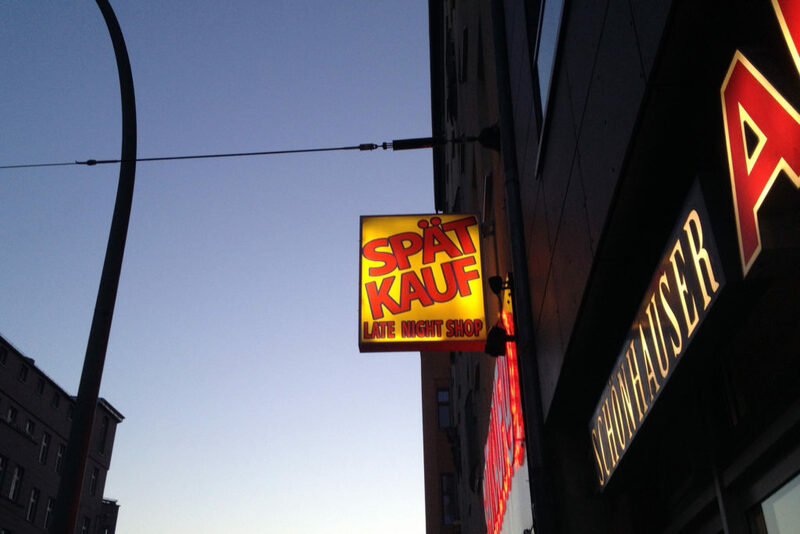 In some areas you may find small shops that have their very own business hours: the so called Spätverkauf or Späti – which would translate into Late Shop. Another exemption applies to Filling Stations / Gas Stations / Service Stations. As far as I know most of Berlin’s Service Stations are open 24/7 – and most of them have at least a small range of products on offer. But chances are you will at least find everything you might need for a breakfast – or to keep a party going. Usually you’ll find milk, butter, bread – sometimes even “freshly baked” bread and buns, cakes and pastries at relatively low prices. But of course you’ll also find crisps, sausages, frozen pizza, beer, wine – and even sparkling wine, Champagne and spirits like Vodka, Gin, Whiskey and Schnapps. hello are the shops/stores/bars are open on these days in Berlin 25/12-27/12 ? sorry, but in Germany / Berlin all shops are closed on 25th and 26th of December – but must restaurants and bare should be open.